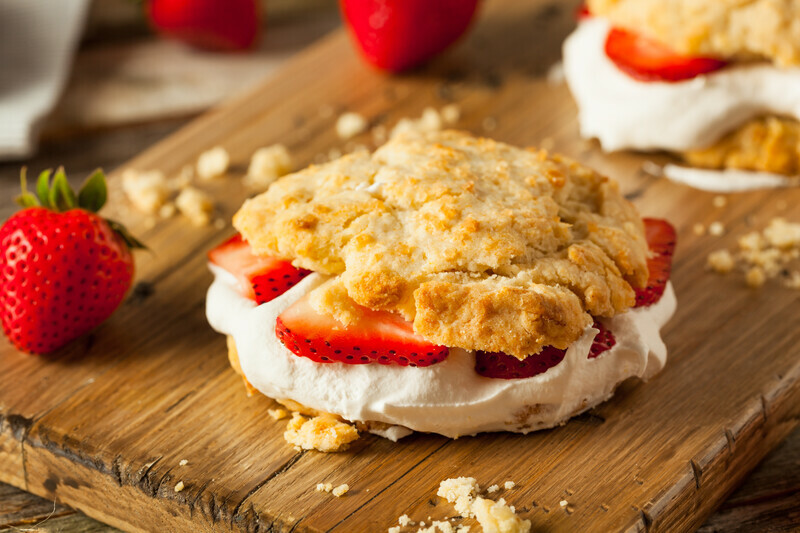 This homemade strawberry shortcake recipe is perfect. Offering homemade biscuits, pound cake or angel food cake for the base and homemade whipped cream and fresh strawberry sauce for topping. More strawberry dessert recipes below. I'm giving you my best homemade strawberry shortcake recipe with different variations. First you want to slice some fresh strawberries and cover them with sugar. They will produce juice that you use to drizzle over strawberries and homemade pound cake or strawberries and homemade angel food cake. Whip up some heavy cream or used thawed Cool Whip and you will have "scrumptious" on a plate. I guarantee it. PREHEAT oven to 450 degrees, and grease a cookie sheet. To make the shortcake; mix flour, baking powder, salt, brown sugar, butter and 2 tsp white sugar - until it resembles a coarse meal. Pour this into a medium bowl. Add the milk and stir just until it forms a soft dough. DO NOT overmix. Use 1 heaping tablespoon for each serving, and drop on the greased cookie sheet; should be approximately 15 servings. Sprinkle the top with 2 tsp white sugar. Bake for 15-20 minutes or until lightly browned. Remove from the oven and place on a wire rack to cool. For the filling; use a medium bowl, and mash 1/2 of the strawberries in it. Mix with the white sugar and vanilla. Refrigerate for 1 hour, while the shortcake is cooling. Now for the awesome whipped cream; In a chilled mixing bowl, beat the heavy whipping cream with the powdered sugar and vanilla until it forms soft peaks. Cut off the tops of the shortcake and spoon the filling into the bottom of each shortcake. Cover with the whipped cream and some of the remaining strawberries; replace the tops. Garnish with the whipped cream and a sliced strawberry. Hull and slice strawberries; rinse them well and drain. In a saucepan, combine the sugar, water and lemon juice. Bring to a light boil. Add lemon zest, and strawberries. Heat through and then stir in the butter. Remove from heat and let cool. Chill before serving over dessert, ice cream or cake.